Modern day furniture can be very costly and if you have done interior work at your home or office, I am sure you would know what I mean. We all like sparkling clean space saving furniture, especially so when its custom made. But as you know, furniture cleaning can be very challenging, especially for the home furniture. Everything in our home or office, require proper maintenance and cleaning being the vital task. If you are not cleaning the furniture properly, then it’s going to lose it charm sooner or later. But thankfully, there are smarter ways to keep wooden furniture clean and shiny and that’s what we are going to discuss in today’s post. We will talk about everything worth knowing about how to keep wooden furniture clean and polished easily. In most Indian household, we get to see a lot of wooden furniture because wood actually represents the tradition and culture of our country. Later on, various other materials were used in manufacturing the furniture to make the items lighter or easily cleanable, but it is the wooden furniture that still dominates over other ones. This is not just for tradition, but also because wood adds to a unique level of sophistication to the entire home. Wooden furniture is costlier than other kinds of furniture and definitely it is because of the quality and the longevity of the items which are far better in comparison to the furniture made from other materials. But, no matter how much durable a furniture is, if you do not maintain it and keep it clean and shiny, it will lose its luster soon with the accumulation of dirt, dust, oil etc. on it. Now, you cannot use the same techniques or the cleaning ingredients for every material because what may suit a steel surface may not be suitable for wooden surfaces. So, you need to know what is best for wooden surfaces and today I will be giving you some important tips on how to keep your wooden furniture clean and shiny easily. These tips will not just beautify your furniture, but it will also protect your furniture from damages and its going to increase its longevity. The beauty of the wooden furniture lies mostly in their texture, be it their matte finish or glossy finish. With time, however, the beauty slowly fades if you do not go for frequent cleaning or timely polishing. The texture of the wood seems to get mostly affected due to the dust, dirt and grease marks on them. So, you need to do proper maintenance of your wooden furniture to increase its longevity and retain its quality. It is best if you can do the dusting weekly but if you are a busy person, then at least do dusting once or twice every month. Polishing is equally important if you want your furniture to look new for long, do it once every year and retain the beauty of your wooden furniture. However, not all wood finishes support polishing and you will have to figure out the type of wood finish you have before you think of polishing it. But you don’t have to worry about it, because I will be discussing all of these in detail. Once you read the post, you are going to get a fair idea of how to maintain your wooden furniture easily. The wooden furniture carries the heritage of India and I am sure we all want to protect them. 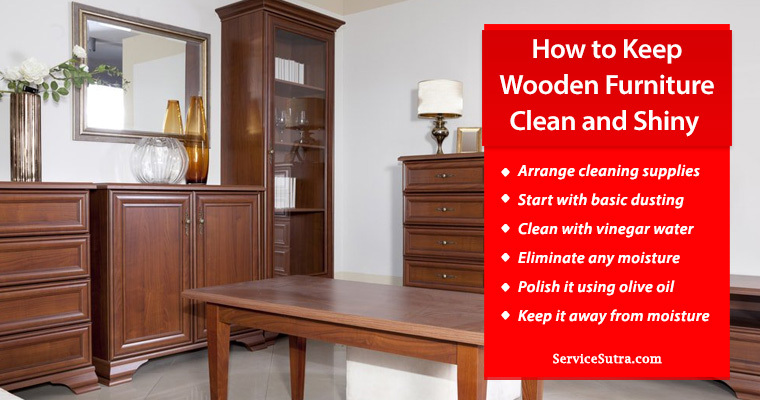 Hence, I am sure that you all are ready to know how, so without wasting much time, let us begin with the important tips on how to keep wooden furniture clean and shiny easily. Last year only, I moved to a new home. Prior to moving to my new home, I got proper interior work done. Naturally my home is full of wooden furniture and I take proper care of all of these and hence they still look new. Well, dusting, cleaning and polishing are the simple ways of maintaining wooden furniture but you must know the techniques to do it right. And today I am happy to share all those hacks and cleaning tips that will help you to keep wooden furniture clean and shiny easily and on your own. Listed below are the most essential hacks that can help you to keep your wooden furniture clean and shiny and increase its longevity. Before you start furniture cleaning, make sure you have all the essential cleaning supplies to get going. Take out your vacuum cleaner and a bucket. Choose a bucket that is big enough to hold minimum 1 gallon of water. Next, you also need to arrange for some clean soft rags but make sure that they have not been used before with other cleaning products as that might damage the quality of your wooden furniture. It is best if you can use a microfiber cloth. After that, you may arrange for some vegetable or olive oil if you want to polish the wooden furniture at the end. The reason I said to arrange for the cleaning supplies is that it will help you complete the task faster. In the middle of cleaning, if you have to run around and search for the cleaning supplies, then that kind of breaks the concentration and delay the task unnecessarily. If you run short of any of the important cleaning materials then that will leave your wooden furniture cleaning incomplete. So, it is best to arrange all the cleaning supplies before you start with actual cleaning. At first, take a clean dry cloth and dampen it with water. Wipe the wooden furniture gently with it. This moisture will help the dust particles to get collected together and will not let them fly away in varying directions. After sometimes, remove the dust from the wooden surfaces with the help of the vacuum cleaner and the brush attached to it. Make sure that you clean off the dust from the carvings and the tight spaces as well. However, remember not to use the attachment in case of upholstery that is on the one that spins because that may lead to a lot of scratches. Use the vacuum to take out the dust from the pillows and the cushions on the wooden furniture as well because there is no point in keeping something dirty on wooden furniture that you have just cleaned. You may dust in the direction of the grain because years of doing it will create distinctive patterns on your wooden surface. If your wooden furniture is too dirty, then while you are cleaning, consider using the solution of vinegar and water. In a bucket, mix around half cup of white vinegar into half gallon of warm water. You may increase the amount of the ingredients in case you have to cover a larger wooden surface area. After that, pour this solution in a spray bottle and then spray it or simply dip a rag into the mixture and use it to clean the wooden surface. Make sure you wring the cloth properly before using it on the wood as excessive water may damage the wood. Continue rubbing the cloth in a circular motion. Rinse it when the cloth gets too dirty or use a new one to clean the remaining furniture. As I just talked about it in my previous point, removing the moisture properly from the surface of the wooden furniture is very important and it is one of the vital tips on how to keep your wooden furniture clean and shiny. If water penetrates deep inside the wooden surfaces then it will decrease the durability of your furniture. So at the end of furniture cleaning, you will have to go for a final buffing to remove any remaining moisture from the surface. Use a dry cloth to rub the surfaces once more in a circular motion and make the surfaces bright and shiny again. Stop it only after you are sure that all of the moisture is removed and the wooden surfaces are almost dry or will get dried up easily. If you want your wooden furniture to look beautiful and shiny all the time, then you need to polish them two times yearly or at least once. Now, polishing does not mean taking professional help, you can easily do it with the help of vegetable or olive oil. These oils also help a lot in getting that perfect shiny finish. But, go a little easy with polishing as too much of polish residue often dulls the wood. However, not all kinds of woods require polishing, so the type of wooden furniture you have is important. In other words, the wood finish is a determining factor, whether it is painted, oiled or is a polished hardwood or is it a special wood like bamboo which requires to be re-moisturized occasionally? The best way to handle this situation is by reading the instructions or consulting with the experts or by taking the help of the websites and the internet for the tips. The main purpose of waxing is to restore the durability of the finish but you need to use a wax that is especially meant for wood. The other alternative that you have in hand is to use an oil-based polish but that will not create a hard finish. Never use an oil polish on a surface which is waxed. It is best to clean painted wood by dusting on a regular basis or by wiping it down using a moistened rag. On the other hand, oiled hardwoods such as oak, beech, teak, and mahogany will require a good oil treatment like teak oil or linseed with a dry fluff-free cloth. In case your wooden furniture is OK with polishing, you can just rub on the wax lightly along the wooden surface grain and form a thin coat. Let it dry a little and then buff it to a clear shine using a soft, clean cloth. Many people also love the just finished smell, so they go for spray polish. So, if you also like it, then get you fresheners and give your wooden furniture a break. Use beeswax polish on woods that are not lacquered. This is because the lacquer will prevent the wax from penetrating so there is no point in wasting your time smoothing just the top. Always remember that it is far better and safe if you clean the woods in a space that is well ventilated. And, whenever you are cleaning, you can just spread newspapers on the top of other items and on the floors so that they do not get dirty in the process. It will become much easier to clean the nearby surrounding spaces after you finish cleaning the furniture. By safe places I mean to keep the furniture in ideal weather conditions. In other words, it is preferable if you keep the wooden furniture away from direct sunlight. And if that is not possible, then try to minimize its exposure to the direct sun light. At the same time, it will be good if you can also avoid keeping the furniture in extremely moist places as that may lead to cracks on them. Over to you: how do you clean and polish your furniture? Wooden furniture is linked to our tradition and culture. It is the most widely used furniture all over the world. It not just looks very aesthetic but it is also very durable. Usually, the cost of wooden furniture is higher than the other kinds of furniture but the money is completely worth it considering the quality. Now, when you have expensive wooden furniture at home or office, I am sure that you will want to preserve its charm, and keep it in good condition as long as possible. But, how will you do that? Obviously by doing proper maintenance, that includes timely cleaning and polishing. I have already talked about how to keep your wooden furniture clean and shiny. You can easily refer to these tips and act accordingly. Dusting, cleaning and polishing are the basic steps to take care of your wooden furniture. But, the type of wood finish you have on the furniture is very important and you must do the cleaning and polishing of your furniture accordingly. Also, place the wooden furniture in perfect weather conditions where they are not exposed to direct sunlight as well as avoid moist areas. I today, have explained properly about the various cleaning processes and have talked about the polishing mechanisms as well. While some wooden furniture does not need polishing and can be kept in good condition simply by dusting the dust and the dirt accumulation on them, other kinds of furniture need to be waxed or given oil treatment to restore the durability of the wooden finish. So, you have to see what kind of wooden finish you have and then take the help of several natural ingredients like white vinegar, vegetable oil, olive oil and other items to take care of your wooden furniture. Lastly, all I want to say is, if you can control the humidity and the weather conditions inside your home, and also take timely care of the furniture by weekly dusting them and polishing them once yearly, your furniture will look new and beautiful for a very long time. And the money that you have invested buying it will not go in vain. Needless to say, if you find it hard to keep your furniture clean and shiny, you may simply hire a house cleaning service provider to get it right. The professional cleaning companies will take care of everything, from arranging cleaning supplies to getting it all cleaned and polished for you. So how do you clean and polish your furniture? Have you tried any of the hacks we have discussed above? Anyways, feel free to share what you do to keep your furniture clean and polished.